located in the city of Hyderabad. Apart from the IMAX screen the multiplex has 5 screens for regular cinema, a shopping mall, entertainment zone, food court, restaurants and several other entertainment including a 4D FX theater, Mirror Maze, Scary House and a large Gaming Zone. Prasads IMAX achieved the Number 1 status in the world for attendance for the movies Harry Potter and the Prisoner of Azkaban, Spider-man 2 and Spider-man 3 and also achieved Number 1 status for highest box office for Spider-man 3 in the IMAX format internationally. It has the biggest IMAX 3D screen in the world. Hyderabad -GVK One, Banjara Hills. Indore -Sapna Sangeeta Mall, Sneha Nagar … Phone Booking:Yes – +91 – 80 – 41128888. SMS Booking:Yes – SMS INOX to 575757 … INOX GVK One, Banjara Hills. 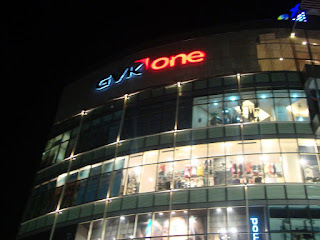 GVK One, 4th Floor, Road no.1 Banjara Hills.